Get a Spread the Word T-Shirt and let's all help spread the word about the dangers of exposure to toxic black mold. Education is the key to preventing this horrible illness. If more people are educated about how dangerous toxic mold is, more people would avoid living in moldy homes and moldy apartments and moldy work places. They would notice that patch of mold growing on the ceiling and instead of ignoring it, will be proactive in taking care of it before it makes them sick. If there was more awareness of the dangers of toxic mold, more people would get mold inspections on houses before they buy them and more people would keep up with home maintenance because they know the health consequences will be far more expensive than the actual repair. More owners of office buildings will know that the consequences of poor building maintenance could be water intrusion and damage which result in mold growth and then results in the inhabitants getting sick. Businesses cannot thrive in the midst of sick building syndrome. Keeping renters healthy is good for business. When the renters are happy, they stay and their business thrives and the owner has continuous renters. Too many people are believing the myth that "Mold Cannot Hurt You" that is being spread around especially by the medical community. The word is being spread as more people get sick and more people know someone who got sick, so awareness is a lot better than 10 years ago. But people are still getting exposed and getting sick, because they are unaware that mold can make them sick. We need to get to the point where people see mold and do something about it urgently. The health care system is being overburdened with mold sick patients that have a huge list of symptoms and feel like they are dying. Doctors give them the "million dollar workup" to figure out what is wrong. They usually end up finding nothing wrong and then the mold sick person does an internet search on their symptoms and finds information on toxic black mold syndrome and then remembers that patch of black mold growing on their bathroom ceiling and how they started feeling sick about the same time that they noticed that patch of mold. We need to get people more aware so that when they see that patch of mold on the ceiling, they will not think "Mold can't hurt me", but will instead think " I had better take care of that before I get sick"
Think of how much money that will save everyone! Prevention is the key to tackling this worldwide epidemic! 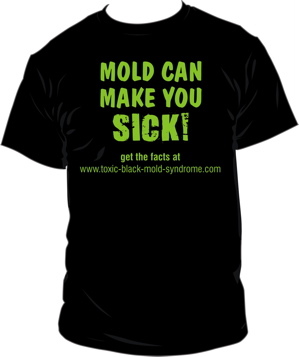 Let's spread the word that "MOLD CAN MAKE YOU SICK!